The New Forest is a beautiful and ancient area in the south of England and is in fact very far from ‘new’. It was a royal hunting estate and was created in 1079 by William I. You will likely know him as William the Conqueror who took possession of that tract of land and everything else in England after that celebrated Hastings battle of 1066. It was first recorded as “Nova Foresta” in the Domesday Book in 1086. This was a survey of all the king’s possessions including people and other livestock. It is the only forest that the book considers in detail, indicating its significance. The unique forest still maintains many of the benefits given to local people by the Crown hundreds of years ago. There are pasturing rights for the locals, known as commoners, to graze their ponies, cattle, pigs and donkeys in the open forest. Palace House was begun in 1204 as the gatehouse to Beaulieu Abbey, and has been the ancestral home of the Montagu family since 1538, when it was bought following the Dissolution of the Monasteries by Henry VIII. It was extended in the 16th century, and again in the 19th. The Beaulieu River runs through the estate and is one of the few privately owned rivers in the world. The Montagu Arms is on the Beaulieu Estate but not owned by it, and was built around 200 years ago. Since the 16th century there has been an inn on the site of this hotel, which would originally have been a meeting place for those aforementioned commoners. It held timber auctions and a cattle market, which took place at the inn until 1809. The original building front was demolished in 1887, with the new building, incorporating Monty’s Inn, being completed in 1888. In 1925 the building was extended to its present size. The front of The Montagu Arms is classically English and somehow frozen in time, but park around the back and enter through the garden and you see another facet of Englishness. Tight planting of traditional shrubs and annuals with small manicured lawns welcomes the guest who might be staying over or just on a visit for the celebrated Afternoon Tea. The reception area is cosy and a vision of dark oak panels. A wide sweeping staircase leads guests to the first floor and 22 stunning bedrooms and suites. 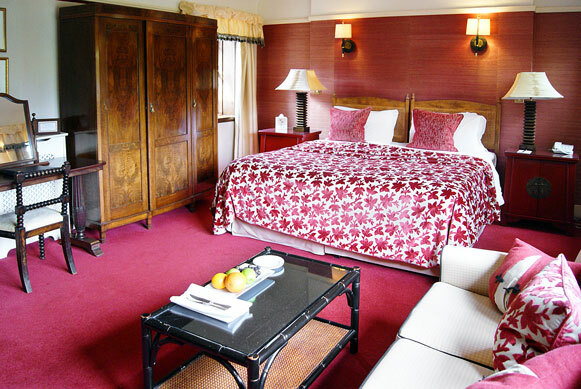 Our rooms consisted of a sumptuous bedroom with leaded windows but contemporary furniture accented with antiques. The bathroom was huge, light, bright and far from anything experienced by guests 200 years ago; that would probably have consisted of a bucket. I love modern amenities. The adjoining private sitting room was stylishly furnished, with coffee and tea-making facilities (although there is a wake-up-cuppa service for those who need a bit of morning encouragement). This space is ideal for after-dinner unwinding. The turn-down service will have been in while you dined and will have closed the curtains and puffed up the cushions. A break at The Montagu Arms isn’t a thing to be hurried. Take your cue from the ponies: graze and wander and enjoy the quiet. 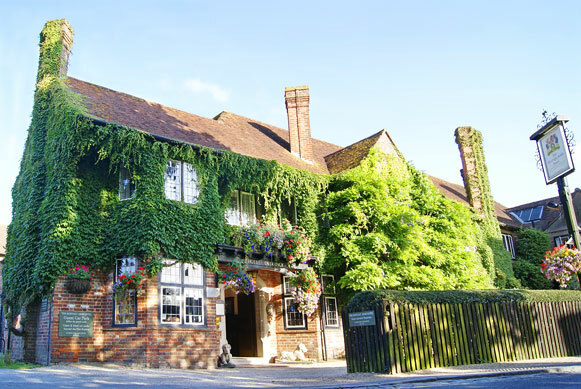 The Montagu Arms is blessed with a Michelin-starred restaurant. The Terrace is presided over by Chef Matthew Tomkinson. He has a passion for local and seasonal produce. He respects it and presents it with innovation. He can confection a simple soup that you’ll still be talking about when you are sipping coffee in your private sitting room – how often can you say that a soup has held your attention? The Terrace is wood-panelled and has a 1920s feel about it. The tables are well-spaced to allow for relaxed conversation. The menu changes with the season and there will always be a new slant on even the most common of vegetables. The food is what you might expect to find in France but it is truly British. It’s a myth to suppose that we need to cross La Manche to find a spectacular dinner. Cannelloni of Braised Rabbit with Glazed Spring Vegetables, Black Pudding Puree and Mustard Sauce was my starter. Take the opportunity to try bunny. It’s a healthy meat and flavourful without being over-gamey. The sauce added an aromatic heat. 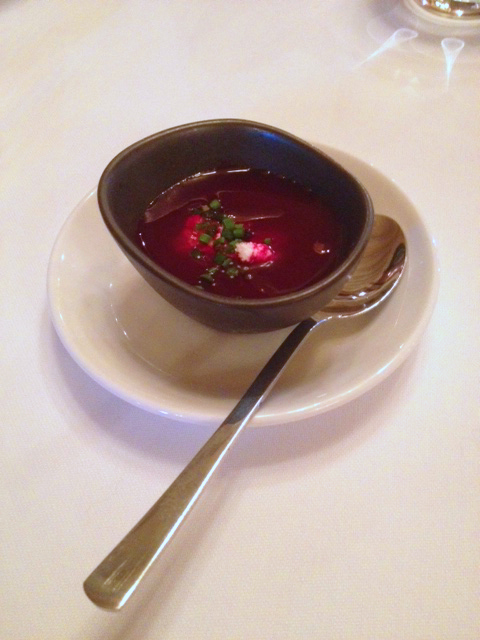 We were served a little amuse bouche of beetroot soup with goats curd. This was almost too beautiful to eat; the culinary equivalent of that ruby-red cut-glass from Eastern Europe. Beetroot is becoming more popular and is now seen fresh in supermarkets, and is being treated as a sweet vegetable rather than a pickle reserved for Sunday teatime. Saddle of Welsh Spring Lamb with Confit Belly, Crispy Sweetbread, Glazed Potatoes, Goat’s Curd and Capers was outstanding. 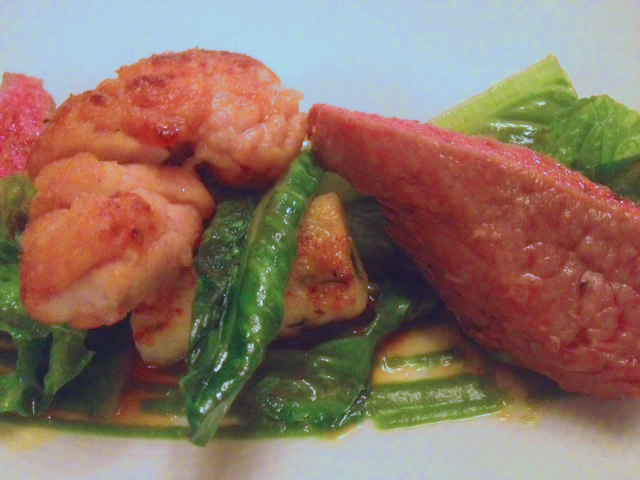 Sweetbreads are often mistakenly believed to be the dangly bits of an animal. In fact, they’re two separate glands – the thymus (from the throat) and the pancreas (from the heart or stomach) that can be taken from calves or lambs. I love them and can honestly say that there is nothing not to like. It’s offal but it’s mild in flavour and usually with a soft and comforting texture; here Matthew adds a crunchy coating. A must try dish on this menu. Assiette of Pennington House Apples with Apple Sorbet and Butterscotch Sauce was dessert. This was a medley of apple sweets, and was a showcase for Matthew Tomkinson’s skill. Yes, it’s only apples as the star ingredient but it’s a dessert that illustrates why that Michelin star has found a home here. This as well as the rest of the menu offered a few ideas that I might try at home. OK, there was plenty that was cheffy but there were elements that would work in a domestic kitchen with a regular home cook at the range. The Montagu Arms takes cheese seriously. It has a proper cheese trolley which is a fast-disappearing vehicle. It rolls around the restaurant offering a full complement of cheese, giving guests the opportunity to taste some of the carefully chosen selection. The gastronomic delights continue with breakfast. Matthew and his staff keep chickens and those free-range eggs are used to great advantage at breakfast. Those and the fresh vegetables are delivered to the kitchen daily, and sometimes more frequently than that. Excellent produce transformed into Michelin-standard meals, and all in this idyllic and historic corner of the New Forest. The Montagu Arms is just what you would hope it to be.